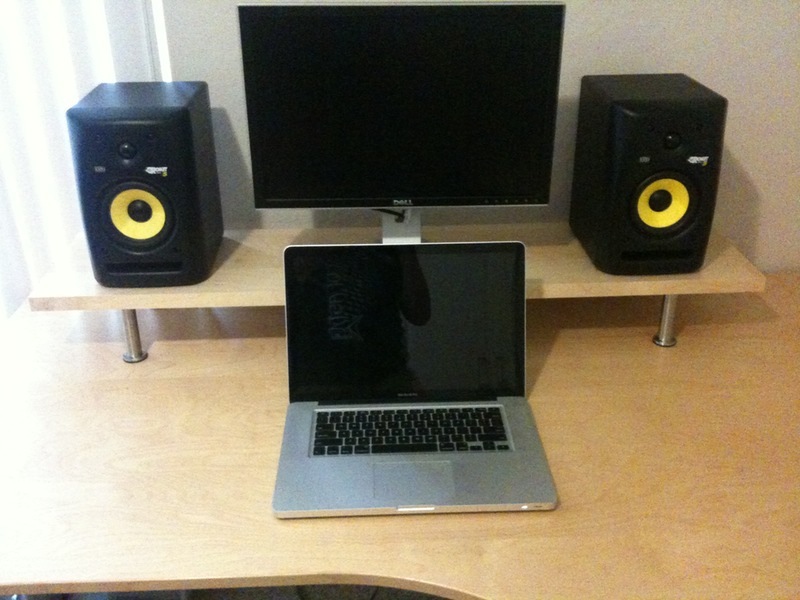 Description: Not too difficult to understand here but I wanted to get my monitor above my laptop and lift the monitor speakers off the desk level as well for better acoustics. Originally I had planned on buying the smaller desktop and ripping it in half with a table saw but spotted the Ekby Jarpen shelf displayed in the kitchen area displays and decided to use that instead. 11" is the perfect depth for the Rokit 5 monitors and allows for the plug and cables to drop without hitting the wall. The Capita's come in 4, 6, and 8 inch, and chose the 4 as the 6's were out of stock, but in turn it was a better choice as it's not too high to be awkward looking but elevates everything perfectly leaving some space underneath for small trays for storage. Assembly is easy. I used the package as the width guide to place the leg plates from the edges and eyeballed the distance from the front and rear of the shelf to about 1/2". In retrospect I would probably move the front ones back to about 1.5" overhang as if I get my eyes down lower I can start the see the screw heads in the plate, but it's hardly noticeable. See more of the Monitor and Speaker Desk platform.